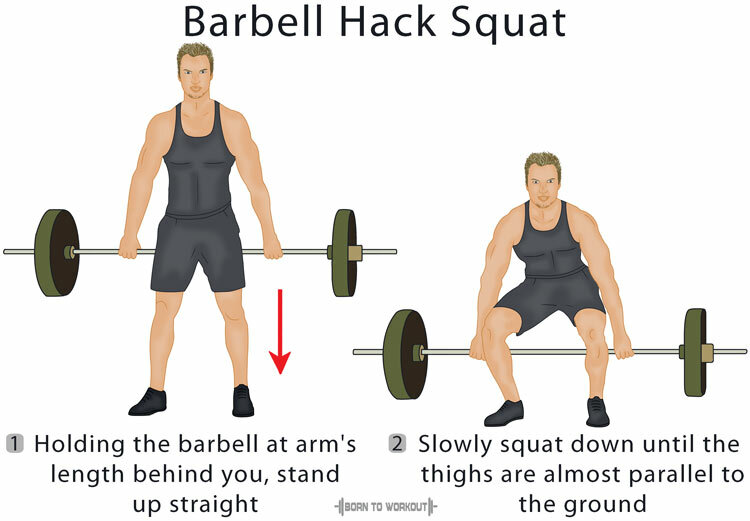 The bb hack squat does not offer much resistance or load on the shoulders and back muscles as the conventional squats minimizing strain on your spine. However, it stresses the quads, helping you to develop the rounded/sweep look that is hard to achieve with other strength-building exercises. Load up an Olympic bar with the desired weight. While grasping the barbell behind you, stand up straight. Keep the barbell at arm’s length, your feet shoulder-width apart, eyes facing forward, head and back straight. This will be the starting position. Slowly squat down until the thighs are almost parallel to the ground. Go back to your starting position by pushing through the heels and squeezing your thighs. While holding the barbell, use a shoulder-width grip with your palms facing back. Wrist wraps will help you to have a better grip. To avoid having a rounded lower back, do not look down when you are at the starting position. Make sure that you are not extending your neck beyond the normal limits.